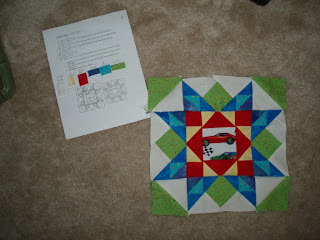 Quilting and other Crafts and maybe some complete nerdiness: Finally! Some quilting for me! Finally! Some quilting for me! Oh I also fixed the block I missed up on. Now it's all pretty and ready to be sewn up with the rest of the quilt. I will probably sew it up tomorrow which should take me like two seconds. I also worked on my stair case quilt but all I did was sew really long strips together because it's basically two pieces of fabric sewn together and than position to make it look like stairs. I cut up all my purple fabric so what I get out of it is all I have. I'll probably finish that quilt top tomorrow. My thread is almost gone! Good thing I got another spool this week. Wow going through a spool of thread makes me feel like I quilted a lot. I'm also feeling like I'm getting better at this following patterns and stuff. These squares didn't take me nearly as long as the 8 inch squares. See I finished both in one night where as the 8 inch ones were a night each. My mother calls me the youngest old person she has ever known. When I was younger I loved to knit and I use to knit stuff all the time. When I was in college I crocheted (I'm probably spelling this wrong), my friends thought it was weird but I thought it was fun. Now I quilt on my free time and it's super fun, when my mother found out about it (she also new about the other hobbies) she was said wow you're an old person! I think quilting is really gearing up though to be a "young" hobbie again, like knitting is cool right now, a lot of friends have taken up knitting for fun now, and soon it will be quilting turns. As I see it I'm just ahead of the game. 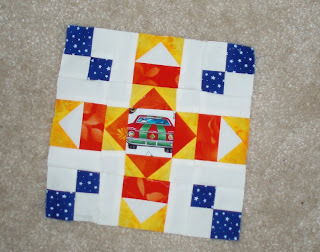 Connie's blog - Quilting friend! 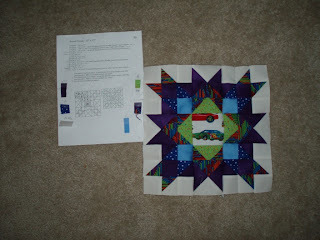 Lynn's Blog - Quilting friend! Ben's blog - My Brother! one chord wonder's blog - does great video game craft art!